Once you try these, you will wonder what you ever loved about Reese’s! Mix butter, peanut butter and vanilla together with hand mixer or by hand. Blend in sugar. Form mixture into small balls (about 1 teaspoon dough per ball). Melt chocolate and paraffin together in the microwave, stirring in 1 minute increments until completely melted and combined. 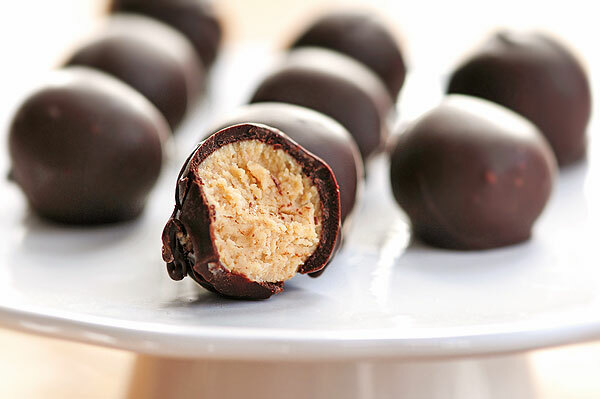 Dip balls into chocolate mixture one at a time and place on waxed paper. Top each piece with a pecan half, if desired. If chocolate begins to harden during the dipping process, just return to the microwave and re-melt. Top with some flake sea salt, a pecan half, chopped nuts such as pistachios, or just leave plain. Great any way!